Hundreds of activists protested on October 7 at Marineland's last day of the season beginning with a rally featuring Ric O'Barry, former Flipper trainer turned dolphin rescuer and star of the Academy-Award winning The Cove and ex-Marineland trainer Phil Demers. Protesters then stormed Marineland and stopped the dolphin "show"--a modern day re-enactment of the stroming of the Bastille prison in Paris in 1789. Ric O'Barry said the protests were a "demonstration of compassion" and that he wished elected officials "would show as much compassion as the people who put them in office." O'Barry would like to see the prohibition of the use of marine mammals in so-called amusement parks. Dylan Powell, an organizer with M.A.D. 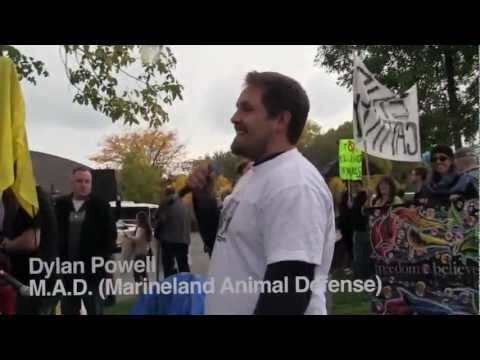 (Marineland Animal Defense) said the campaign targets the owner John Holder and not the workers at Marineland and that many workers have resigned in protest to the abuse and death of Marineland's animals. Phil Demers, an ex-trainer at Marineland, said with tears in his eyes how he befriended Smooshi -- a female, wild caught Pacific walrus-- and how urgently they need to be rescued so that their lives can be spared from Marineland's horrid conditions.